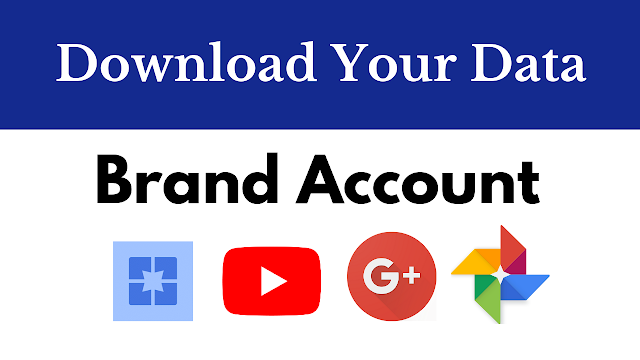 If you are using a Brand Account identity for your YouTube Channel or Google+ Page, you can - and should - use Google Takeout to download an archive of your content. Google+ Page content needs to be downloaded before consumer Google+ shuts down on April 2, 2019. A Brand Account lets you have a brand, business, organization identity on Google that is different than your personal Google Account identity. Brand Accounts can have multiple Owners and Managers, who sign in to their own Google Account to manage the Brand Account and any Google services on that Brand Account. Currently the only Google products that officially support a Brand Account identity are YouTube, Google+ and Google Photos. While YouTube lets you download an MP4 file of your videos from your video manager, those downloads are limited to lower resolution 360p or 720p, depending on the size of the video. If you use Google Takeout instead, your videos are either exported in their original format within the first 6 months after upload. After 6 months, they may be downloaded as a high quality compressed version (MP4 files with H264 video and AAC audio). The default is to download all of your data. Note that you will not be able to download comments posted by other people. You can check to see if you are signed in as the Owner in your YouTube channel's Advanced Settings (www.youtube.com/account_advanced). That will show if you are signed in as Owner, Manager or into your account directly. If you don't see your Brand Account, click All your Brand Accounts and then click the Brand Account name to return to Takeout. 5. Select the Google Products you want to archive. Toggle the switch to the right of YouTube. You can also select other Google products to archive (although your Brand Account isn't likely to have data other than for Google Photos and Google+). 6. 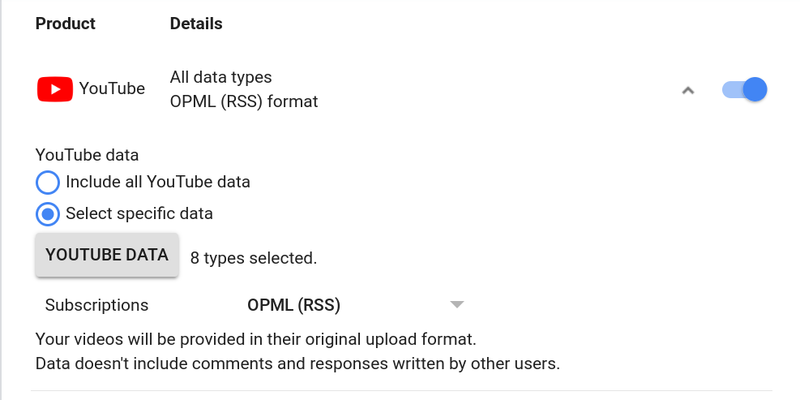 Optional: Select which YouTube data you want to archive. The default is to create an archive of everything. Click the down arrow to the right of YouTube to see the option to customize. Click Select specific data to choose which data you want. You can also choose the file format for Subscriptions: OMPL (RSS) or JSON. .zip is the default and should be openable on almost any device. Your device may have difficulty opening larger files, and they will take longer to download. If your total archive is larger than the max archive size, it will be split into multiple files to download. I think ideally at least one copy of your archive should be saved on an offline hard drive, one you can access even if you lost access to all your online accounts. However, if you only have a phone or tablet, it likely doesn't have enough storage for your archive. If that is the case, select one of the cloud storage options. You may need to pay for additional storage depending on your archive size. The archive creation process can take some time if you have a lot of content. Google will send you an email notification when the archive is ready. f you did not choose the option to use one of your cloud data storage accounts, you will have to return to download your files. There should be a link in the email notification, but if that does not work. Make sure you are viewing the Manage Archives page with your Brand Account identity. If you have shares a lot of photos or other images on Google+ the total archive size my be very large. You may want to create separate archives of each type of Google+ data separately so that you have some smaller files. Toggle the switch to the right of the Google+ product options. 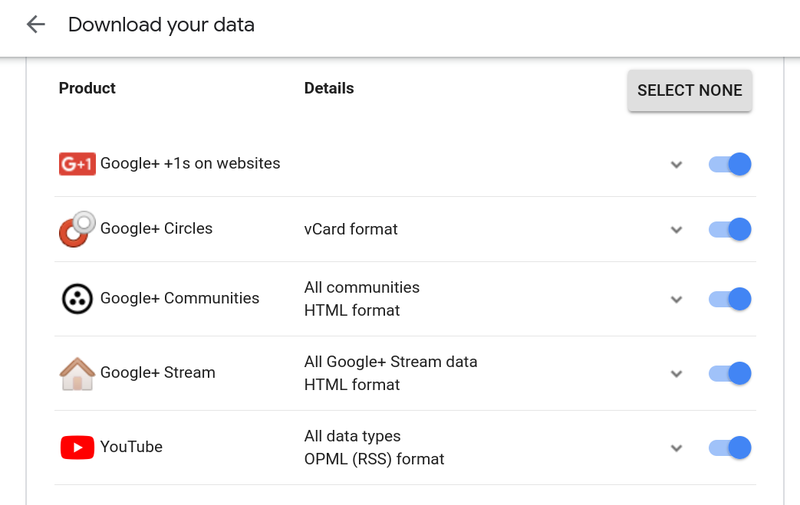 You can also select other Google products to archive (although your Brand Account isn't likely to have data other than for Google Photos and YouTube). 6. Optional: Select which Google+ data you want to archive. The default is to create an archive of everything. Click the down arrow to the right of each Google+ product to see the option to customize. I recommend saving a copy to offline storage. However, if you only have a mobile device, or otherwise don't have enough offline storage for your archive, select one of the cloud storage options. You may need to pay for additional storage depending on your archive size. If you did not choose the option to use one of your cloud data storage accounts, you will have to return to download your files. There should be a link in the email notification, but if that does not work. If you get an error after creating your archive, try again in a couple of days. Archives are available for 7 days after creation. You can download each archive up to 5 times. You can create multiple archives of the same data.